While Alexander von Humboldt lived nearly one hundred years after Daniel Defoe, he epitomized the generation of Enlightenment scientific explorers. This book recounts the Prussian scientist’s journey to the Americas, during which he explored the Orinoco River that is featured in Robinson Crusoe. While ultimately he did not find the source of the Orinoco, Humboldt did traverse the Casiquiare canal that connects the Orinoco and the Amazon. Humboldt pursued a great number of scientific interests in his travels including botany, geography, geology, and meteorology. In a tangential connection to Defoe, one of Humboldt’s tutors had been the German translator of Robinson Crusoe, the first German edition of which is on display in this exhibit. Alexander von Humboldt (1769-1859), Aimé Bonpland (1773-1858) and Helen Maria Williams (1762-1827). 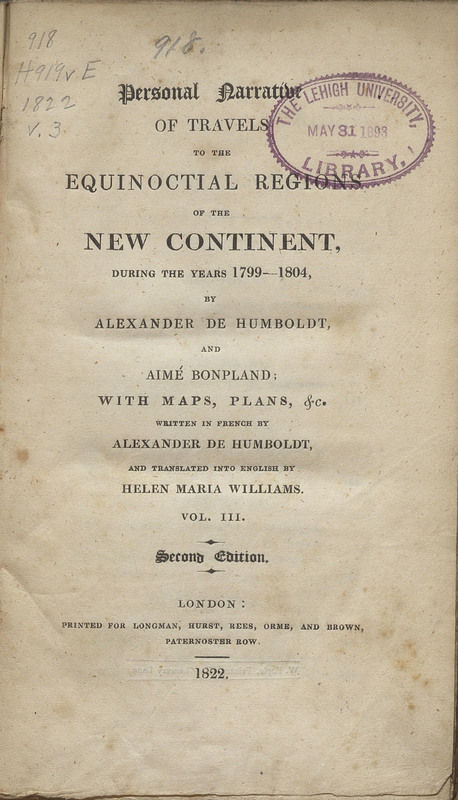 Personal Narrative of Travels to the Equinoctial Regions of the New Continent, During the Years 1799-1804. Volume 3. London: Longman, Hurst, Rees, Orme, and Brown…, 1814-1829.